As their name suggests this band attempted to push back the frontiers of musical experience. They wrote and arranged all their compositions enjoying considerable recording freedom. 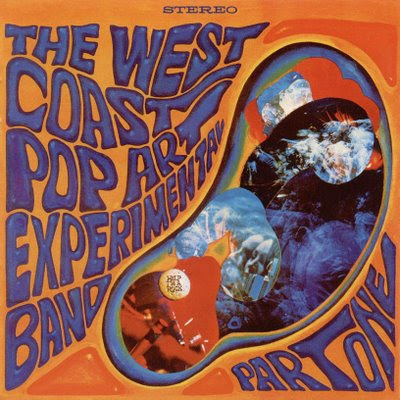 The West Coast Pop Art Experimental Band (WCPAEB) were the first L.A outfit to have a light show and were one of the biggest bands in town in the early days (in fact, the Mothers Of Invention once opened for them). Ironically, despite their reputation as psychedelic enfant terribles, none of the members used drugs (just like another purveyor of freaky music, Frank Zappa). The Harris brothers and Michael Lloyd first met in 1964 when they were all students at the Hollywood Professional School - the school attended by most of the kids working in show-business. The three certainly had pedigree. Shaun and Danny were the sons of one of the U.S's best-known classical composers, Roy Harris, and Michael was a musical prodigy who had been working professionally for some time as a member of the New Dimensions. They first worked together as The Laughing Wind, and as such recorded a 45 for Tower Records, entitled: - Good To Be Around/Don't Take Very Much To See Tomorrow. In order for them to start performing they needed a drummer, and for a short while Danny Belsky, an old friend and former band member with Michael filled in on their first recordings. Thereafter, John Ware played live with the band and legendary drummers Hal Blaine and Jimmy Gordon played in the studio. Their final member Bob Markley was introduced to them by Kim Fowley at a party he was throwing for The Yardbirds first U.S. tour at Markley's house. Markley was a wealthy attorney originally from Oklahoma who badly wanted to be in a band so he could get lots of girls (true!). Although a lot older than the other three (he was about 30, they were 16 or 17), he made a deal with them that he'd provide them with equipment if he could be in the band. As he didn't sing or play an instrument, he held a tambourine and stood in front of a dead mike. Markley's role in the band remains unclear. Because of his background in law, the other three left him with more and more business control, preferring to concentrate on the music. It's probable as a result that most of the production and composing credits attributed to him are spurious. Contrary to what most articles of the band allege, Michael Lloyd never left the band and continued making the albums with the Harris brothers right up to the demise of the band. Markley's social connections helped them to get a deal with Reprise Records where they recorded three albums despite having no commercial success whatsoever. Their second album, reissued by Reprise a few years ago, blended 'experimental' tracks such as 1906, Help I'm A Rock and Transparent Day with the melodic harmonies of Shifting Sands, I Won't Hurt You, Leiyla, Here's Where You Belong and If You Want This Love. Their first 45 was taken from this LP. Prior to this LP they recorded material for an earlier privately-pressed album in 1966 which is one of the rarest sixties artifacts. Some of that material and other oddities were issued by Raspberry Sawfly Records in 1982 (SAW 8001), and the "Fifo" album has subsequently been reissued officially by Sundazed. Volume 2 was more adventurous and consequently inconsistent. Tracks like In The Arena sound badly disjointed yet others like Suppose They Give A War And No One Comes with its strong dynamic contrasts are very effective, and Delicate Fawn is a joyful little ditty. However, the prominent track on this album is probably the highly original Tracy Had A Hard Day Sunday. Unlike much of the other material on the album, this tune had considerable commercial appeal. A later 45, Smell Of Incense was taken from this album. It must have made quite an impression 'cos it was also recorded by The Abstracts on their LP, The Pawnbrokers and by Southwest F.O.B.. In fact, the single was only belatedly released a year after the album in response to the latter's hit version of the song. Their next effort was less ambitious, containing a number of competent conventional songs such as As Kind As Summer and the enchanting, haunting As The World Rises And Falls. Some of the material shows a strong satirical bent, like A Child Of A Few Hours Is Burning To Death with its deadly blues riff, sarcastic megaphone-on-a-parade-ground vocals, and martial atmosphere. The title track combines a chiliastic invitation with mock-travelogue music to unique effect and Eighteen Is Over The Hill is as perfectly-realized a piece of music as can be imagined. Altogether it represented a considerable improvement on their previous efforts. Incidentally, the order of tracks on this record bears little relationship to the order given on the record sleeve. The group recorded one final effort on the Amos label before splitting, Markley's attempts to dominate the band finally alienating the other three. Markley later made a solo album with a supporting band, A Group (Forward SFT 1007) in 1969 and produced some material for J.J. Light. After the group broke up Shaun and Dan Harris headed for the Midwest as The California Spectrum. They had a great light show and for about 14 - 16 months toured very successfully. Shaun relocated to Denver for a year or so, performing as The Spectrum and also booking and promoting other bands. He later released a solo LP, Shaun Harris (Capitol ST 11168) 1973, consisting of soft country rock (with orchestrations by his father, Roy Harris) and subsequently has collaborated with Michael on an almost endless stream of recordings from 1970 to the present. Michael became vice-president of MGM Records and one of the best-known producers in Los Angeles. Dan continued writing and working with Michael and Shaun. In 1984, he moved to Sweden where he performed and recorded very successfully. A few years later he travelled back to L.A., where he currently resides. He teaches guitar, performs, acts and writes with his wife, Vicky.